What’s good? My very first helmet was a Bell RT, back in 1981 when I started riding on the road – and they have certainly come on since then. The Bell Star was launched earlier this year, about the same time I took delivery of my Triumph Thruxton R long-term test bike and I’ve worn it pretty much every day since. Bell certainly haven’t dropped any clangers here. The Star works well with a naked bike, with very little buffeting, mostly thanks to its aerodynamic shape. Even on the Thruxton R it’s pretty quiet, so I tend only to use earplugs on longer journeys. The visor is thicker than most (about 3mm), so there’s no rattling around. The mechanism pulls it backwards as it clicks into place, keeping it firmly down when closed and helping the soft rubber seal keep out unwanted drafts and rain. Another really nice thing about the visor is its removal and replacement operation. 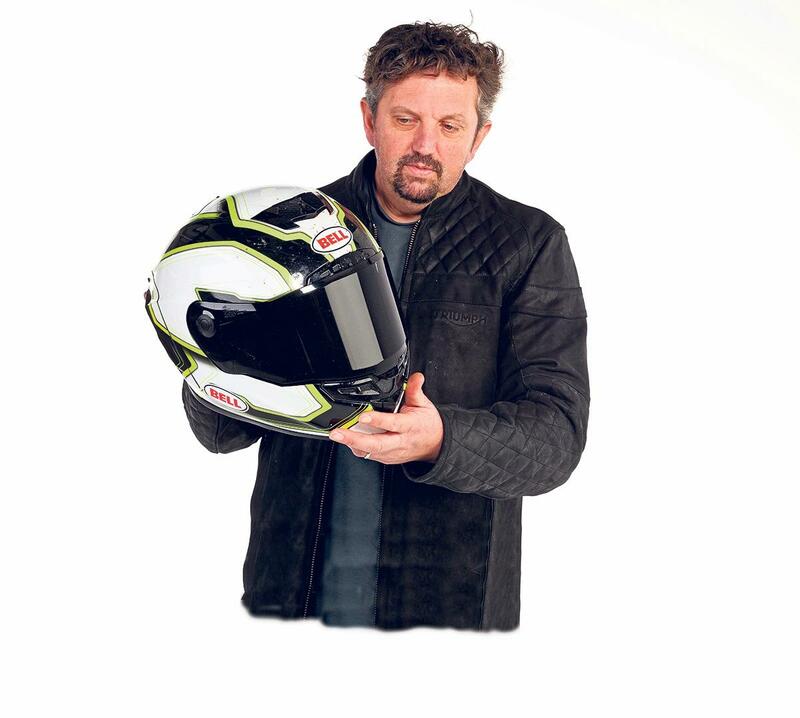 Simply push in the two buttons either side of the helmet, raise the visor upwards, then off it comes. The same goes for putting it back on. Easy peasey with no messing about. Ventilation is good, which makes a big difference in the summer months. There is one vent above and one below the visor, plus an additional two on top both front and rear with a wiremesh exhaust vent at the back. The helmet overall is very comfortable and well-padded with a liner that stays fresh but can also easily be removed for cleaning. The shell is constructed from a mix of three materials (Aramid fibres, carbon fibre and fibreglass) which keep it light but affordable compared to full carbon helmets. The chin strap uses conventional D-ring, but uses a less conventional yet simple to-use magnetic clasp to stop the end of the strap flapping in the wind. Nice touch! What’s not? Since I fitted a handlebar lowering kit to my Thruxton R I find my view of the horizon slightly obscured by the top of the aperture, so with this change I would have been better to have opted for the Race Star which was developed for this more aggressive riding position.